Storage: All of the bags collected were processed and then removed to storage in the FISP field office, Mana Gallery, for additional cataloguing in March, 2014. We began with site preparation and set up; cutting grass (grown tall in the non-compacted soils) and extending the existing fence to enclose the planned excavation area. Eight new fence posts of equal diameter to those that existed previously were planted c. 200cm deep. The surface was cleared and the excavation grid was reestablished. The line from the EISP survey marker was extended along the northeast perimeter of Square 31 beyond RR-001-157 to define three squares in front of RR-001-156 and beyond 01, 02, and 03. These were then numbered 21, 22, and 23. The last recorded depths reached during the last season of Phase 1 are as follows: Square 01 at 160cm; Square 02 at 160cm and Square 03 at 170cm. Our preliminary objective is to remove the backfill from Squares 01, 02, and 03 to the previously excavated floor of 170cm without repeating previous screening. We will also remove the previous backfill from Squares 04, 05, and 06. Previous levels reached in those squares are 474cm, 220cm, and 270cm, respectively. Because these squares are in direct proximity to the statue, and because we anticipate that at least some material from under the papa and behind the statue also may have been deposited in front of the statue in these areas, we will screen everything in Squares 04, 05, and 06 below the 170cm level. The material collected during this process consisted of basalt, carbon, obsidian, and animal (sheep) bone. We initiate the excavation by removing the backfill to expose the old walls of our previous excavation. The stratigraphy reveals the scar of the burned soil as anticipated in the photograph we have c. 1920 which shows a massive fire in front of this statue (EISP Archives). Scattered carbon and apparent sheep bone (tiny fragments) were collected. The northeast wall of Squares 03 and 06 displays a stratigraphy that is an obvious extension of that recorded in Square 19 and continuing behind RR-001-157. 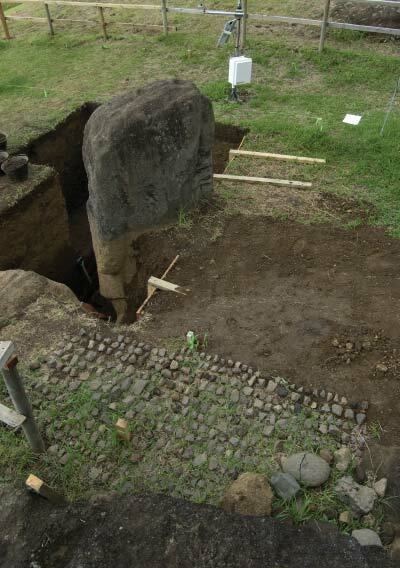 Included in the non-screened backfill are 1 intact, large poro; 1 large, oval poro of pitted basalt which had been broken (the missing piece was later found), and 6 other large, unworked stones that were previously retrieved, documented and then deposited in the backfill last season. One small beach pebble (maea poro) was embedded in the Square 01 sidewall and is similar in size to that found in R.K. Dunn’s geological Core 15 (cultural material). Thomson (1891) reports these and other similar objects found buried at, for example, house foundation entrances, as fetish stones. Eighteen bags were collected on the first day (August 12) and the following levels were reached below previous backfill: Square 03, 80cm; Square 06, 60cm. A portion of the sidewall of Square 07 was removed to 70cm. In the first 30cm of the newly excavated Square 23 we collected multiple small fragments of carbon. The sidewall of Square 23 (northeastern) contains multiple scattered carbon at 30cm and pieces of what appears to be burned obsidian were retrieved. These are a milky blue/black and the soil itself is nearly black. The wall is pockmarked and below it consists of decomposed lapilli or olive-yellow clay material. Soil texture is extremely pebbly and seems to be composed almost exclusively of highly weathered tuff that takes on the look of decomposed basalt. This continues to about 60cm and at 70cm obsidian flakes increase in number. In Square 22 to 30cm the stratigraphy is a composed of a dark brown organic colluvium. Below that is an uneven layer of light brown, uneven measures of light brown to yellow clay (decomposed lapilli) shot through with tiny lapilli pebbles. There is another uneven, thin layer of black decomposed pebbly tuff material, as above, with nothing resembling peat. One large piece of coral was found at this level. From 30 to 60cm we encounter nothing of note. Bits of carbon and basalt appear along with one toki fragment at 20-40cm and another at 60cm. In Square 06 exotic stone material identified as hematite (red; also found in Square 22 at 1m and Square 23 at 150cm), magnetite (weakly magnetic) and banded vesicular basalt are encountered at 70cm. Red scoria is identified in Square 23 at 80cm. We have now a modest collection of spear point-like objects made of basalt (two found in Square 23 at 150cm). Rat and fish bone appear in Square 23 at 160-170cm. It is apparent that a small depression or drainage hole in the dirt had previously formed at the base of the papa on the southwestern side of Quarry 2. It is approximately 35cm long and was created by runoff during the previous months in the compacted dirt following backfill. There is a visible surface channel running approximately 3.5m toward Square 04. At the left shoulder of the statue in Square 04 the exit hole of the water is visible in the rear wall. This is an apparent surface manifestation of the runoff that has created a nearly constant flow of water that was documented at the base of this statue on the same side during previous seasons. Heavy rains on August 16 created a separate drainage line running from behind RR-001-157 to the left shoulder of RR-001-156. This drainage pattern suggested that it would be useful to construct a small plywood wall on either side of the statue to shore up the rear walls during the excavation, to be removed following backfill at the end of the season. Excavation continues on Squares 22 and 23. During this week we have screened very heavy, wet soil and have found small amounts of carbon scattered throughout. There is very heavy black soil throughout Square 22 down to 2m. The newly excavated squares retain their stratigraphy to 2m very well, with few changes. The dark brown layer retains pebbly decomposed tuff at 150cm. At 180cm we recover what may be human bone (this is just below coral previously retrieved and some red pigment (kie’a). Similarly, small bits of bone were found at 150cm in Square 23 and photographed. Square 22 at 147-160cm revealed a tooth that appears to be that of a child (see previous findings at the read or the statue). Rat bone and carbon also recovered. We begin screening Square 02 at 160cm. Squares 02 and 04 are each excavated to the 250cm level and Square 05 to the 180-250cm level. The plywood walls previously decided upon are established on either side of the statue. There is mixed carbon and bone, most of which appears to be sheep, collected throughout the week, along with obsidian flakes in small quantity. Objects that appear to be tools and resemble obsidian mata’a but which are of basalt are recovered. Red pigment and samples of hematite are recovered (Square 02 at 230-260cm, Square 05 at 180-250cm, and Square 06 at 230-250 cm). We collected another of several stones which are oval, gray, and appear to be marking stones, as they can be used to create distinct black lines on wood or stone. In Square 01 at 250cm we spent some time brushing the surface of the stone and documenting the petroglyphs on the front of the torso. 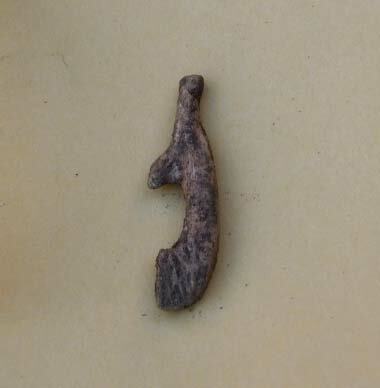 It is a pecked crescent referred to as “vaka” and has a slanted line or “end extension” that recalls the incised vaka design on the boulder we collected at the pavement at the base of Rr-001-157. In Square 02 at 230cm we found a bone fishhook (mangai), one piece, broken at the tip (bag 154). In the same square and at 260cm we collected a worked bone artifact that appears to be a needle (Bag 156). 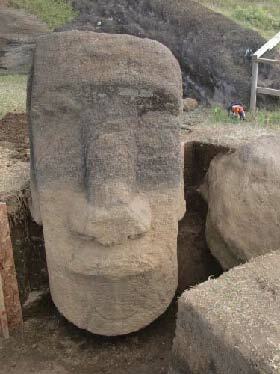 An incomplete mata’a was found in the same square at 230-260cm. Additional coral was found in Square 02 at 200-230cm and in Square 06 at 230cm. This is a short week due to heavy rain, and began with continued excavation of Square 02 and 05. Square 04 was excavated by hand to 250cm level. We continue to recover bone (sheep) and multitudes of carbon. One piece of amber glass was retrieved from Square 05 at 250cm. This material, along with cordage (twine) found at just 30cm in Square 23 documents the historic intrusion level to 250cm. According to available data in the EISP Archives, during the time of the Williamson, Balfour Company and when it was managed by Henry Percy Edmunds, Rapanui men who assisted with livestock were allowed to take an occasional sheep or lamb for their own consumption. The evidence we have to date is that cooking and consuming sheep and lamb in the traditional Rapanui manner certainly took place in Rano Raraku in general and at this site. 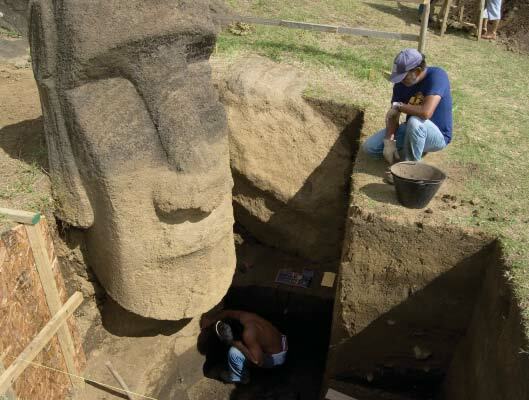 Whether this was done as theft, as reward for service to the Company, or during participation in any one of several European expeditions into Rano Raraku interior is not known. However, the evidence suggests that the bulk of this historic material (paper, plastic, cordage, metal, etc.) probably dates to c. 1920s. Collections related to the Mana Expedition (1914-15), the Franco-Belgian Expedition (1934-1935), and the Norwegian Archaeological Expedition (1934-35) have also been documented during these excavations. 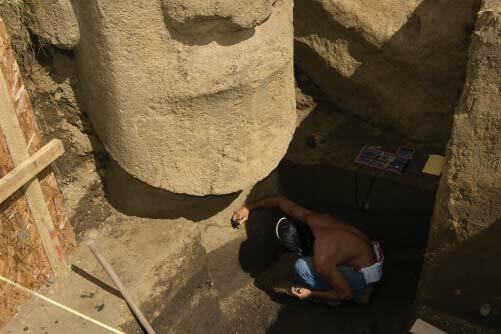 The toki, the majority of which were incomplete and some only small fragments, were documented as previously. At the end of the excavation season we will store them. The rains continued nearly unabated from August 30. The decision was made to remove the plastic and wood retaining wall and backfill to our start level. This work was initiated Sept 3 and carried out as weather permitted by EISP personnel and with the aid of personnel loaned by CONAF and CMN. We are indebted to them for their timely help. A backup copy of the photogrammetric data collected by Greg Downing with the assistance of Ivon Tuki Atan, along with an up to date download of the weather station data collected by Tahira Edmunds, will be carried to the EISP office in California. Soils samples that were selected from the bores made by Dr. R.K. Dunn were treated to floatation by Sonia Haoa Cardinali and these will also be taken to UCLA for possible further analysis. The geological map created in the field by Dunn will be drafted and completed in the EISP office in California. One of our field crew (Urano Aravena Pakarati) will visit the site once a week from August 30 to November 1, 2013 to maintain its integrity and report to CONAF any problems as they may arise. EISP excavations were conducted in Squares 04, 05, 06, part of 07, and in newly established Squares 21, 22, and 23 of the ventral side of RR-001-156. Plywood walls were built to stabilize the rear walls of the excavation on either side of the statue. These were subsequently removed at the end of the field season. The historic level was established through the minimal presence of twine and bits of metal at between 200-250cm. Skillfully worked, traditionally known objects of basalt, obsidian, and bone (a fishhook and a needle) were collected, along with less well-understood objects including possible marking stones, polishing or abrading stones, and modest quantities of obsidian and basalt, carbon, bone, pigment and coral. Human activities of tool manufacturing, tool use, possible burial or other ceremonies, and food processing and consumption are all indicated. Consultant Dr. Richard K. Dunn (voices.norwich.edu/Richard Dunn/) worked with us August 14-20. His task was to create a geological map of the interior of Rano Raraku quarry. In addition, he provided the geological identifications of “red scoria,” hematite, magnetite, and banded vesicular basalt materials retrieved in the excavation. Finally, he consulted with us to clarify the terms “tephra” and “tuff” and others used in our description of soils and/or stratigraphic layers. Greg Downing (www.gregdowning.com) accomplished the photogrammetric documentation of each of our excavated standing statues (RR-001-156 and RR-001-157) as well as of others in the interior, including RR-001-250 and RR-001-220. 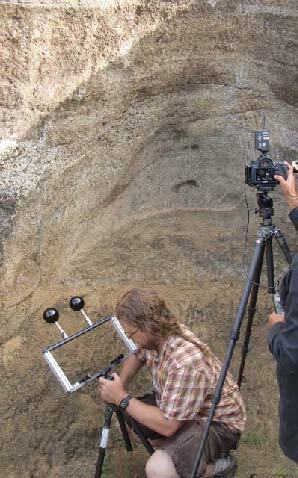 He further documented in the same manner the rear walls of Quarries 2 and 15, and used Reflectance Transformation Imaging (RTI; previously known as Polynomial Textural Mapping, PTM) technology to bring out details of carving marks and petroglyphs for our record. Finally, at the special request of CONAF he conducted a photogrammetric survey of a statue in the interior that is endangered by its current precarious position. Johannes Van Tilburg documented the previous grid and established an extension of it for the current excavations, and aided in excavations. Susana Nahoe, CONAF; Merahi Atam López, CMN; Jimena Ramírez G.